Very.co.uk is a fantastic website, offering all the new trends with a very affordable price tag. You can do your shopping spree during your lunch break, you will receive your parcel at your desk and it is very easy to return something if it doesn't fit you or you want to exchange it with a smaller size. All this without the hassle of traipsing through crowded streets and packed up shops. I've picked some of my favourite looks from this new season. I love this ensemble from the Fearne Cotton collection at Very.co.uk. The positive.negative print in a range of berry colours is very autumn. Great with thick tights and black patent leather brogues. The price is fabulous with the top at £ 25.00 and the asymmetrical skirt with big zip at £ 29.00. This trousers suit with detachable fur collar from the Definitions collection at Very.co.uk is a beauty. Teal is a great colour and the print circle reminds me of the 1970s look. The blazer has got a ribbon instead of buttons and it is priced at £ 39.00, while the trousers are £ 27.00. Let's start thinking about Christmas parties here, it is never too late for that and the first party can land anytime in the next few weeks. This beautiful lace dress from the Definitions collection in a green hue is perfect and timeless and spending just £ 49.00 you can be sure to be always right depending on what dress code is on the invite. The textured coat from the Definitions collection at £ 79.00 will keep you warm through all the cold season. Great floral print from the Fearne Cotton collection for this kimono jacket and trousers. It is very easy to match with everything you 've got in your wardrobe and I am sure it will be a staple, perfect for winter and when the weather is going to be warmer. I can see myself wearing this outfit while travelling by plane because it is comfortable and it keeps you covered when air con is a full blast. The kimono is priced at £ 39.00 and the trousers at £ 35.00. 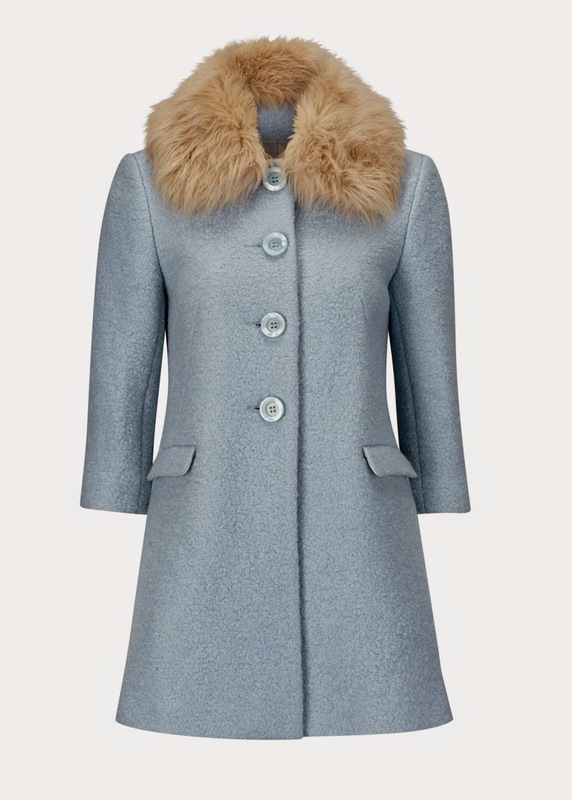 This baby doll pale blue coat with fur collar from the Love Label at Very.co.uk has got a vintage look that is timeless. Priced at £ 69.00 it will be one of those garments that will be always on trend. I gave you a sneak peek into the new collection, now it is up to you to go to www.very.co.uk and check more and more outfits for a very trendy winter.